We practice Shotokan Karate. Karate. Kara means 'empty' and te means 'hand'. So karate is mainly a striking art, focusing on punching, kicking, elbow and open handed techniques such as palm strikes. Shotokan is a style of karate developed by Ginchin Funakoshi. The meaning of the name Shotokan comes from Funakoshi's pen name, 'Shoto' meaning pine leaves and 'Kan' meaning house. 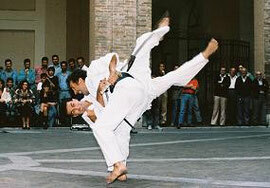 There are many other styles of karate. Each style has its own characteristics, Shotokan is known for its dynamic and impressive kata and also its combination of speed and power in fighting techniques. Sensei Camillini (Godan-5th Dan) is a very experienced and enthusiastic Sensei and thus every session's training is both enjoyable and of the highest standard (see our instructor page for more details). Each training session will start with a warm up which will get the body and mind prepared for the lesson. There is 3 main components of karate: 'Kihon', 'Kata', and 'Kumite'. 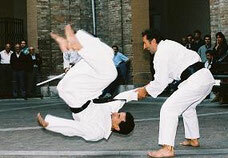 'Kihon' means fundamentals or basics which enables the student of karate to practice the timing, power, speed and focus of techniques. 'Kata' means form or pattern, each form has a name that is recognised in any Shotokan dojo across the world. Wrist lock ending in a throw at the Yoshitaka street demonstration of Karate. The Karate we practice develops balance, speed, flexibility and strength. Aside from physical benefits of karate, the specific training techniques used in the class result in self-confidence, motivation and self-esteem - that carry over to all aspects of life. Please check our training times page. 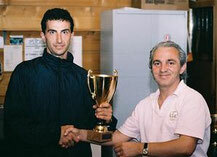 Sensei P. Camillini receiving an award. The instructor or 'Sensei' at Yoshitaka Karate Club is Sensei Patritzio Camillini (Godan-5th Dan). He has over 40 years of experience in the Martial Arts. He is a very enthusiastic instructor and hopes his students will enjoy practicing Shotokan Karate as much as he does! If you would like to find out more information about Patritzio please click here. Or email him at patriziocam(at)hotmail.com (please remove (at) and replace with @).